Don’t kid yourself. “Paper PM investments” will be under attack for as long as financial markets function – and thus, even when physical gold and silver inevitably win their war with the purveyors of fraudulent fiat currency and “financial markets”, there’s no guarantee that anything other than the real thing will benefit. Last week’s Miles Franklin All-Star Silver Webinar; in which, it was noted that despite the heinous price suppression of the past six years (that will decidedly end, when the 5½ year downtrend line the Cartel is viciously defending is inevitably broken), the Cartel has been unable to push gold below its cost of production no matter how hard it’s tried. To that end, per the below chart from Steve St. Angelo, the Cartel has never been able to “achieve” this “goal,” all the way back to the bull market’s start at the turn of the century. Similarly, in the silver market, where he estimates the current cost of production to be around $16-$17/oz, not including the “all-in” costs discussed below. Trust me, if the 2015 cost of production was $1,116/oz for the world’s two largest miners, the overall industry average is much higher. Let alone, the “all-in” cost of maintaining production – which is much, much higher, given that industry-wide proven reserves have been plunging for years. Not to mention, the fact that – as I predicted in more than two years ago, when no one else was talking about it – “peak gold” was reached in 2015, with nowhere to go but down. And likely silver, given that production declined in 2016; let alone, recent developments like plunging production in Peru – the world’s second largest silver producer; and on an industry-wide basis, all-time low productivity. As for the attractiveness of physical metal versus “paper PM investments,” here’s a comparison of the impact the Cartel has had on the mining industry over the past 15 years. 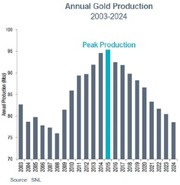 In gold’s case, production rose by less than 15% over the entire period, with the prospect of plunging, per the above chart, back to turn of the century levels over the next decade. Meanwhile, above-ground, available-for-sale inventories have similarly plunged – as evidenced by the whopping 70% decline in COMEX registered inventories since 2008 alone; whilst global demand hit an all-time high in 2015, before numerous currencies started serially crashing. Which, I might add, is a trend that must accelerate in the coming years, as history’s largest, most destructive fiat Ponzi scheme races through its malignant terminal phase. 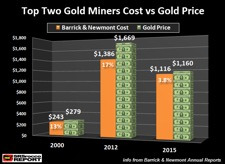 Moreover, Newmont is projecting flat production into the foreseeable future; and Barrick, a catastrophic production collapse – which may be why, following last night’s disastrous 1Q earnings report, ABX stock is down more than 10%. This, as their cumulative share counts have tripled, as their outstanding debt surged tenfold (again, these are the world’s two largest; and arguably, best capitalized; miners). Throw in the added wildcard of relentlessly increasing operational risks; let alone, market-based risks, such as the recent GDXJ/JNUG rebalancing disaster; and you can see why the reward/risk outlook for physical metal is so much more favorable. But I digress, given that I’ve already penned a page and a half of text – and haven’t even gotten to today’s myriad PiMBEEB topics; let alone, today’s extremely important principal topic. Regarding the former; first off, Donald Trump’s proposal of a, for all intents and purposes, completely unfunded corporate tax cut – projected to add $2 trillion to the national debt, just as the “debt ceiling” is about to be reached. This, as he announced onerous import tariffs against China and Canada – which no doubt, will be imminently retaliated against; as simultaneously, the first U.S. warships reached the Korean Peninsula. This, atop the potential government shutdown less than a week away; the historic nuclear war drills in New York and Washington – as if the fear-mongering couldn’t get any more intense; simultaneous with North Korea’s “largest ever live-fire drill.” And oh yeah, the prospect of all laptops being banned from Europe to U.S. flights. Next, the dichotomy of exploding home prices and rents – driving the cost of living up further, in an environment of record-low savings, labor participation, and real earnings; whilst all other economic data weakens – such as, in the week’s first two days alone, the “unexpected” declines in the Chicago Fed National Activity Index, Dallas Fed Manufacturing survey, Richmond Fed Manufacturing Index, and Conference Board Consumer Confidence. This, as crude oil prices – the principal component of the (comically understated) CPI inflation rate that has the Fed in a tizzy about raising rates; not to mention, a harbinger of global industrial demand; threaten to plunge below $49/bbl, despite all manner of “oil PPT” jawboning. This, as amidst these – and countless other – debilitating headwinds, the Fed predicts 1Q GDP growth, to be reported Friday, of just 0.5% – putting in jeopardy the third longest “expansion” of the 47 in America’s 241-year history. But don’t worry, what could possibly go wrong? I mean, France is “fixed”; and the PPT-supported NASDAQ, sporting dotcom-like valuations, is above 6,000. And finally, today’s all-important principal topic, which had two principal catalysts. The first, Jayant Bhandari’s must read article about the economic devastation wrought by Narendra Modi’s draconian Indian cash ban; and the second, a unique, rapidly unfolding situation in the world of Bitcoin – which as I write, is hitting a new all-time high. From a larger perspective, it goes back to the Chinese capital controls instituted in January – when the offshore Yuan devaluation threatened to spiral out of control; and “larger” still, the terrifying physical gold and silver shortages of 2008. Let’s start with India, where generations of fiat-hating citizens have been using Precious Metals – in either bullion or jewelry form – as their primary wealth storage tool. In 2015, with the Rupee hitting a new all-time low, the despotic India government – before Narendra Modi – enacted onerous gold and silver tariffs that remain to this day, with the goal of reducing imports under the comically transparent, and logically fallacious, ruse of “reducing the trade deficit.” So what did Indian citizens do? They of course, started a massive black market; resulting in surging demand – which unfortunately, can no longer be accurately measured; and surging premiums over fraudulent Western “spot” prices. Then there’s the Chinese government; which, amidst exploding capital outflows, as history’s largest (government-created) financial and economic bubble started to deflate; launched draconian capital controls in early January, just as the speculatively-traded “offshore Yuan” was on the verge of breaking above the key psychological level of 7.0/dollar. Among them, controls on Chinese Bitcoin exchanges – which similarly, continue to this day – prohibiting all Bitcoin withdrawals. In other words, you can trade Bitcoin, but you can’t withdraw it. Which, given that Bitcoin’s market cap is still a piddling $20 billion, should tell you all you need to know of how terrified governments are of it. Initially, global Bitcoin prices plunged on this news – but less than four months later, only Chinese Bitcoin prices remain subdued, at a 20%-25% discount to the aforementioned, all-time high prices at non-Chinese exchanges. Of course, the beauty of Bitcoin – like Indian gold and silver – is that prices are set at the margin by the “black market” known as localbitcoins.com; at which, buyers and sellers anonymously transact at “off exchange” prices. Which is exactly what happened in China – as simultaneous with the plunge in Bitcoin exchange volumes, came an explosion in anonymous, but definitely Chinese-based, “Local Bitcoins” transactions. Similarly, we saw the world’s largest U.S.-dollar-traded Bitcoin Exchange – Hong Kong-based Bitfinex – abruptly, and indefinitely, prohibit U.S. dollar withdrawals two weeks ago. The reason being, that its principal wire agent, U.S.-based Wells Fargo, informed them that it was no longer comfortable “abetting” Bitcoin transactions; clearly, for fear they would be labeled “money launderers” by the U.S. government. Which, as we have learned in crystal clear manner throughout two decades of Precious Metals suppression, doesn’t take kindly to “threats” to dollar hegemony – anymore than the Chinese government fears threats to the far more fragile Yuan. So, what have Bitfinex account holders done in response? To Wells Fargo’s chagrin; and the same “analysts” that relentlessly predict Bitcoin’s demise; they have been using their Bitfinex cash holdings to buy more Bitcoin, given that Bitcoin withdrawals are still allowed. Which in turn, are being withdrawn, and sold via Local Bitcoins at similarly elevated prices; in turn, validating these prices, and the “Bitcoin network’s” efficacy. Which in turn, have started to drag prices higher on other global Bitcoin exchanges, despite the imminent threat that they, too, face, from Well Fargo and other Bitcoin (and gold) hating, fiat Ponzi scheme-supporting criminals known as “too big to fail” banks. In other words, “black markets” are setting prices, no matter what the powers that be attempt. 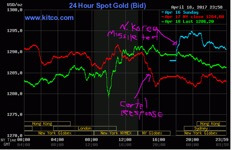 Which sounds eerily like what occurred in 2008; when, amidst the biggest financial crisis of our lifetimes – which inevitably, must return in full force – the Cartel brutally smashed paper gold and silver as global stock and commodity markets crashed, per their time-honored rule of not allowing history’s best safe-haven assets to be viewed as such, at the times they are needed most. Which, I might add, is exactly what occurred after the April 7th Syrian invasion and April 15th North Korean missile test; developments which, to say the least, are far from resolved. As history’s largest, most destructive fiat Ponzi scheme implodes, government attempts to “control” competing currencies – or better put, monies – will become progressively more draconian; as has been the case with all such situations throughout history. 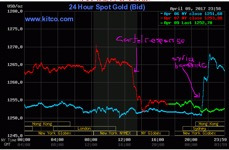 However, they will all miserably fail – as the “future of wealth storage”; be it gold, silver, Bitcoin, or any “competing” currency – will unquestionably migrate, in Jim Sinclair’s words, “out of the system.” Which is why, more than ever, the need to own physical assets, rather than exchange or brokerage held paper assets, is so urgent.